I would like to give you a glimpse into my life and share with you a little of my own personal development during 30 years of yoga practice and teaching. 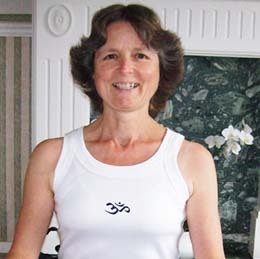 I am in my 60’s and my main occupation is teaching Iyengar yoga in Salisbury, Wiltshire. I have over 30 years’ experience of teaching classes and individual sessions and I have also been an assessor of trainee teachers. I am so lucky to have an occupation that I love and which I am so passionate about. Many books describe the benefits which can be gained, on all levels, from the practice of yoga (see book list) but I had no idea all those years ago where my own practice would actually lead me. On a physical level I continue to improve year by year, so I can honestly say that on each birthday I feel even better than the previous year. How amazing is that! .... Except surely this is how we should all choose to be. Mentally and emotionally I know I have changed so much, I am more aware of myself and gain more control of my thoughts daily. But even more important is my progress spiritually. This is so exciting and special and fills me with so much joy (see my other website "Pathway to Happiness"). As my yoga practice continues I have become more open to everything around me, and realise how much we all can miss on a spiritual level when immersed in our daily lives. What is just as exciting is that these developments are open to us all, and the practice of yoga is a brilliant tool to help us find the way to wherever each of us wishes to go. The practice of yoga over the years has shown me that every aspect of the body, mind and spirit is important, and of course having knowledge about what we eat is fundamental to gaining the supreme health and harmony which we all wish for. So for me, an important part of my yoga development has been realising that what I put into my body is as important as what I do with my external body. Over the years of developing self-awareness and self–knowledge, I have experienced a natural transition into a raw, vegan, living food life-style. I now consume only simple raw plant life which is packed with all the wonderful life giving energies which nature, in all its wisdom, has to offer. It is amazing where self-awareness can lead us. I love my teaching. I love to share my excitement and discoveries with others and if my experiences can help anyone else on their own journey, that is brilliant. Each week the content of my teaching is different; my teaching always has the detail and accuracy involved with the postures and the workings of the body. 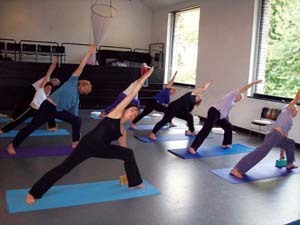 This is fundamental to the practice of yoga which is what Iyengar yoga is known for worldwide. It is what helps you to become more in touch with yourself and eventually more in harmony with yourself and your surroundings. However my teaching also includes all aspects of how the body and mind work together, helping each individual to realise that what they are thinking affects their body, and how every pose and their attitude to the pose relates to their own lives. Therefore each class can be a journey of discovery on all levels. The wonderful thing about the practice of yoga is that you never know where it will take you next! I look forward to sharing this magical journey with you.